I Want To Introduce You To Chris Berry! Second Assistant Superintendent! 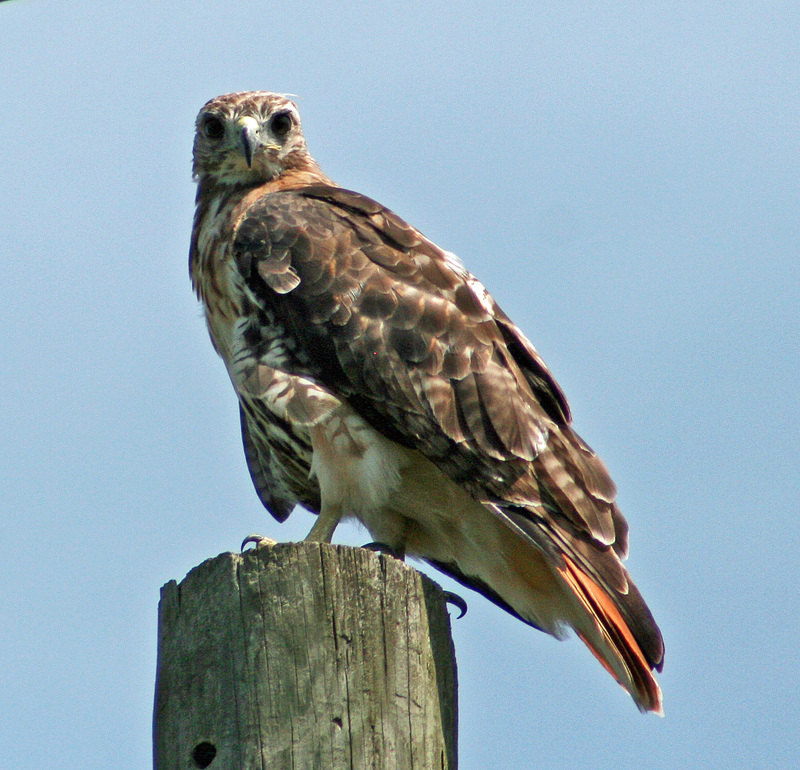 Second Assistant Golf Course Superintendent. Continuing Education: Toro Irrigation School. Active participant in every seminar possible related to Golf Course Management. Even at his own expense! 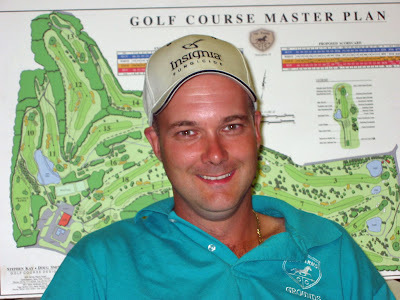 Chris has worked at The Farms Country Club since the spring of the year 2000. Since then he has mastered almost every task performed on the course. Not only has he excelled at all tasks, but has provided us with an individual who is proficient at welding and fabrication. Besides the obvious course skills, he is a computer “Wiz”. We don’t have a hired company to keep our computer systems running smoothly… We have Chris! He is a tremendous asset! Chris’s love for the game of golf and his diverse abilities made him a perfect fit for the maintenance staff. Chris moved up the ranks quickly and (after a lot of begging on my part) graciously accepted the role of 2nd Assistant Superintendent. Chris continually seeks self-improvement in the turf management field through any means possible. His tireless effort to expand his knowledge is proof of his dedication to the position. He is one of those rare individuals who takes his job personally. He treats the golf course as if it were his own. Many times while Chris is playing the course you will notice he is carrying his notebook, radio and irrigation maps, just in case he encounters a matter that needs to be attended to. I can’t tell you how many times I’m at the course in off hours and Chris will show up and say he just needed to check on something at the course. This type of dedication cannot be taught by a manager! Chris brings it to the table every day, 365 days a year. I am so proud to introduce Chris Berry. Without his intense desire and effort to be the best at his position, we would not consistently be able to maintain the grounds to the level you are accustomed to! 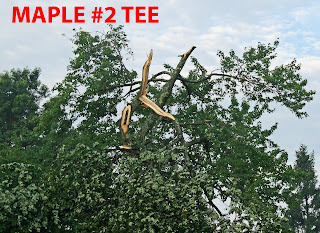 Golf Courses Across The Country In Survival Mode! Superintendents across the country are trying everything they can to keep turf alive in a summer that might be one for the record books! 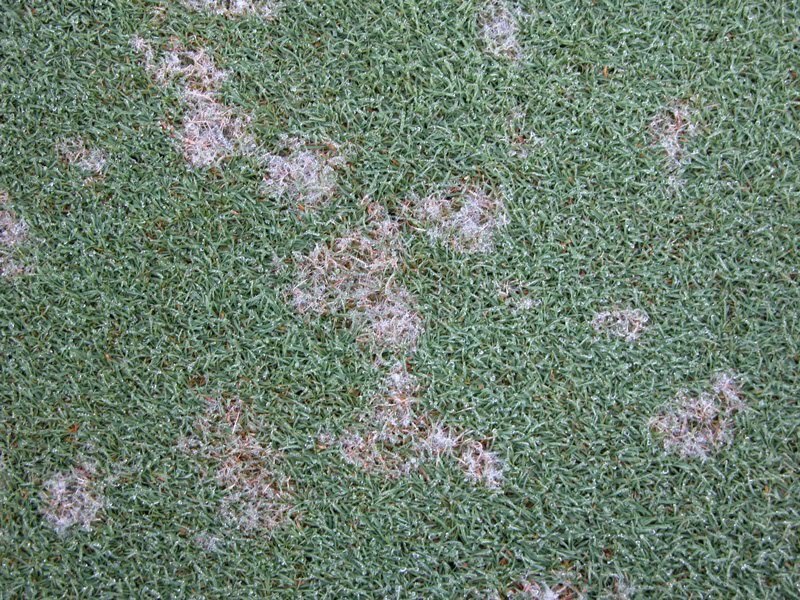 For those clubs that have high percentages of Poa Annua, the struggle is even more difficult. Soil temperatures are so high that the root systems are failing. 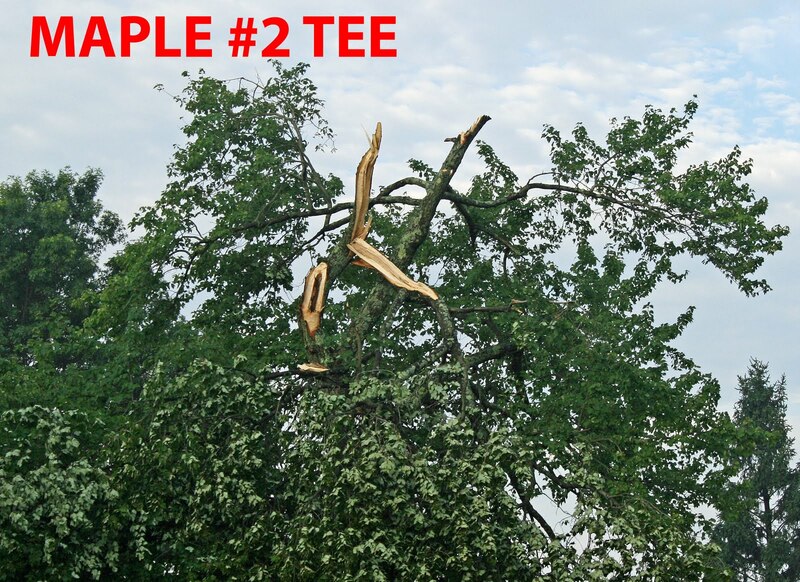 There is nothing a superintendent can do when this happens. The genetic limitations of Annual Bluegrass can not be overcome. My goal is to use every tool at my disposal to save as much turf as possible through the rest of the summer. 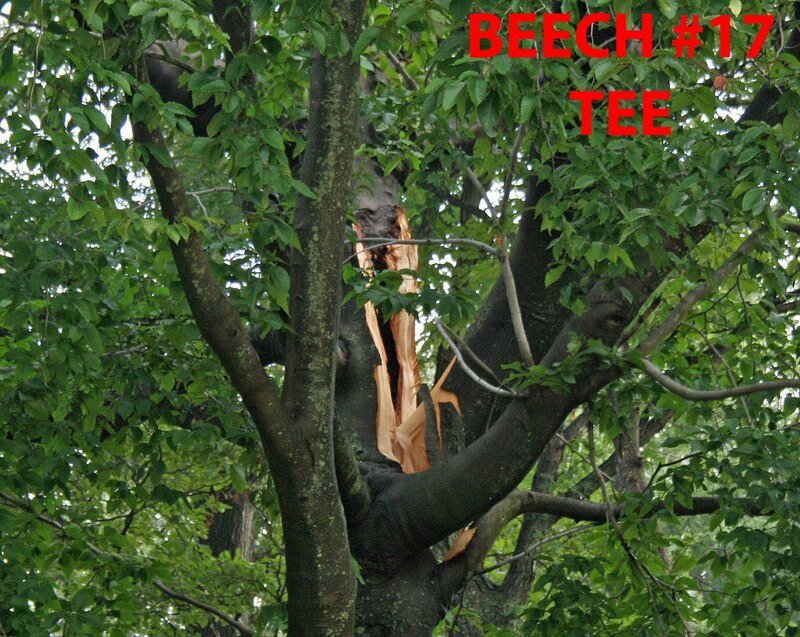 Once we turn the corner in the weather department, we will overseed effected areas and begin the healing process. I have to say, I am quite pleased with where we sit right now! While we are seeing turf thin in several areas and for any number of reasons, we are still in good shape for what we have been experiencing. 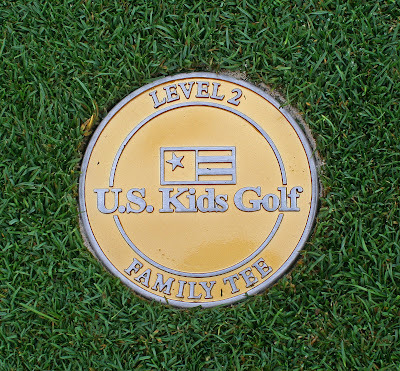 Check out these two links and see what GCSAA and the USGA have to say on this subject. We are needle tining greens beginning today. We will be performing this important cultural practice during "off-peak" periods to reduce inconvenience to members. 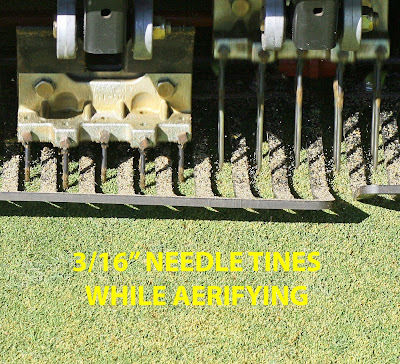 Needle tining is a non-invasive type of aerification that utilizes a very small 3/16 inch solid tine. This type of aerification is used to vent turf during high stress periods. The weather conditions we've been experiencing have most certainly been stressful to turf. We are at the point of summer when turf stress is at its peak. Our goal every summer is to help our turfgrass survive the intense stress until weather patterns improve and turf can begin the recovery process. Only 34 days left until September! The foursome of Mr. Hardy, Mr. Coyle, Dr. Aceto and Mr. Iovene called me over to the third tee to get some pictures of this hawk. We have begun the removal of the trees that were damaged in the storm Friday night. 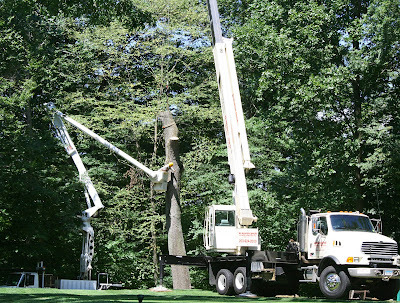 The following picture and video shows the careful removal process using a bucket truck and crane. 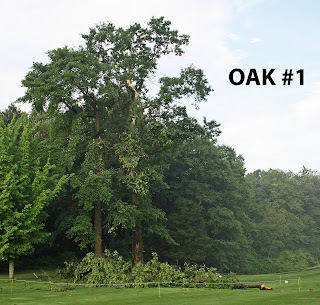 Storm Damages Four Large Trees On Course! 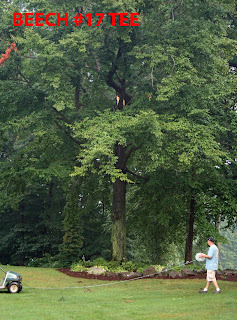 An intense storm last night sent the maintenance staff scrambling this morning. Four large trees sustained serious damage. Our immediate goals were to make the golf course playable for the start of Ryder Cup weekend and to make sure players would be safe. 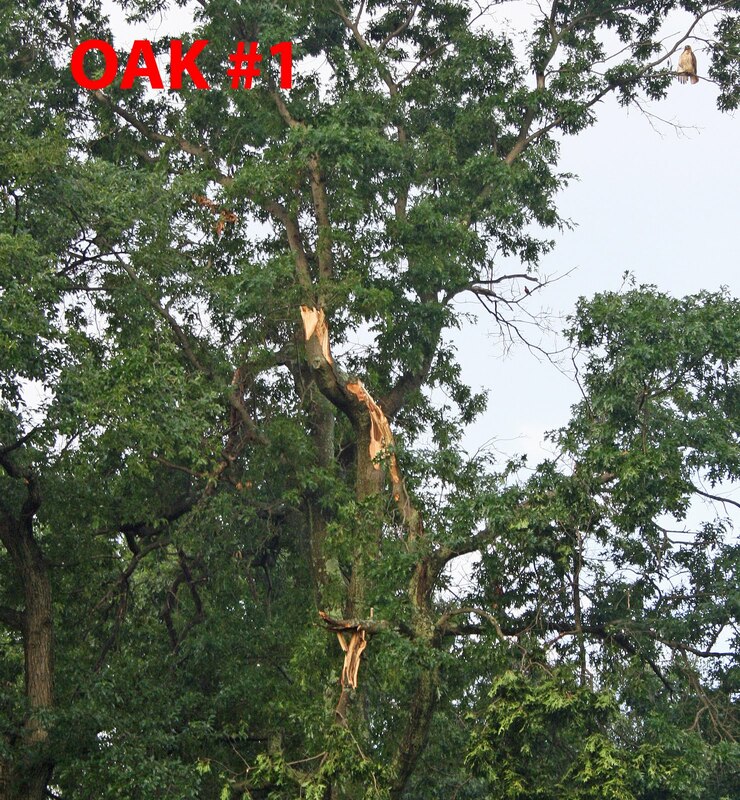 We cleared as much debris from play areas as possible and roped off the danger zones around the damaged trees. Under no circumstances should any player enter the roped off areas. Golfers playing hole #16 are being directed off the path in front of the tee and must follow the white line to the front of #17 tee. Tee markers on #17 have been moved to the 1st cut path in front of the tee. 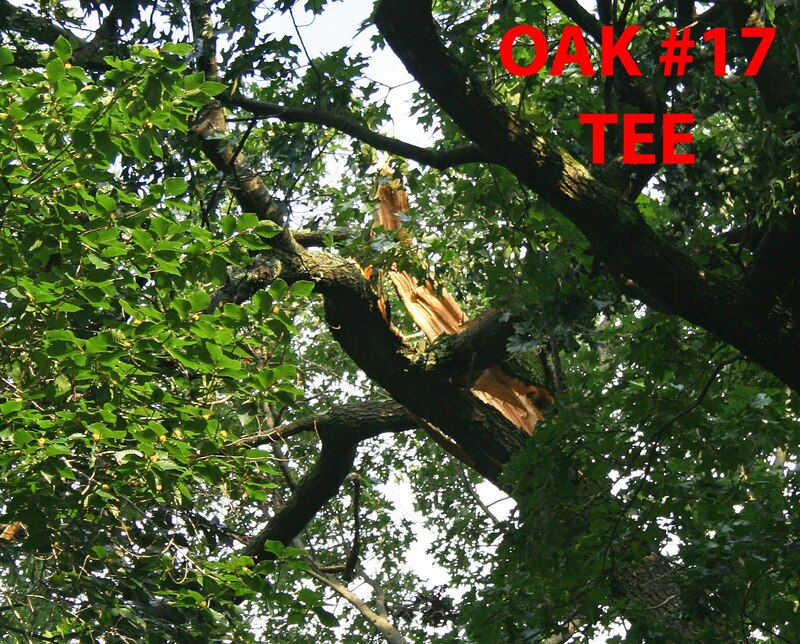 Our tree company was on site by 7AM to access the damage. They will begin the cleanup first thing Monday morning. All work should be complete by Tuesday evening. 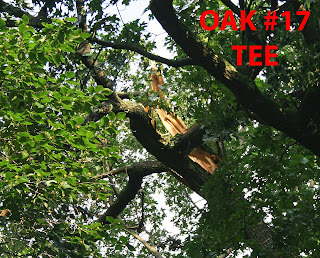 The Oak on hole #1 will be pruned for safety. The remaining three trees (Maple #2 tee, Beech #17 tee & Oak #17 tee) will be removed. Golf Course Superintendents Association Of America Recognizes My Blog! I'm proud to announce that the Golf Course Superintendents Association Of America (GCSAA) has noticed my blog! Check out the following link to see what they have to say. Annual Bluegrass Weevil Damage Is Very Localized So Far! 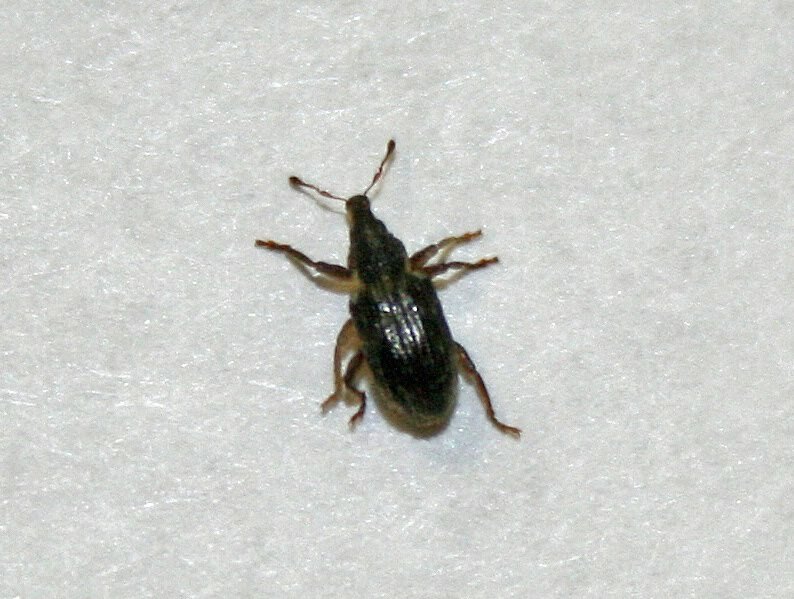 The Annual Bluegrass Weevil is an insect that causes damage to, you guessed it, Poa Annua! This tiny insect can cause serious damage to our predominately Poa Annua golf course. We normally go through several generations in a season. 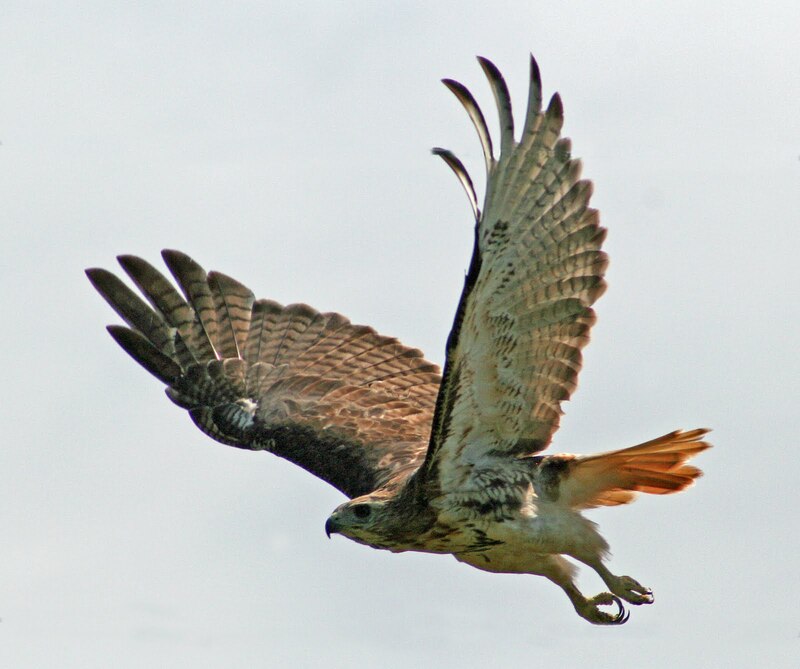 We begin our control strategy in early spring by targeting adults before they lay their eggs. Next we target young larvae that have hatched. 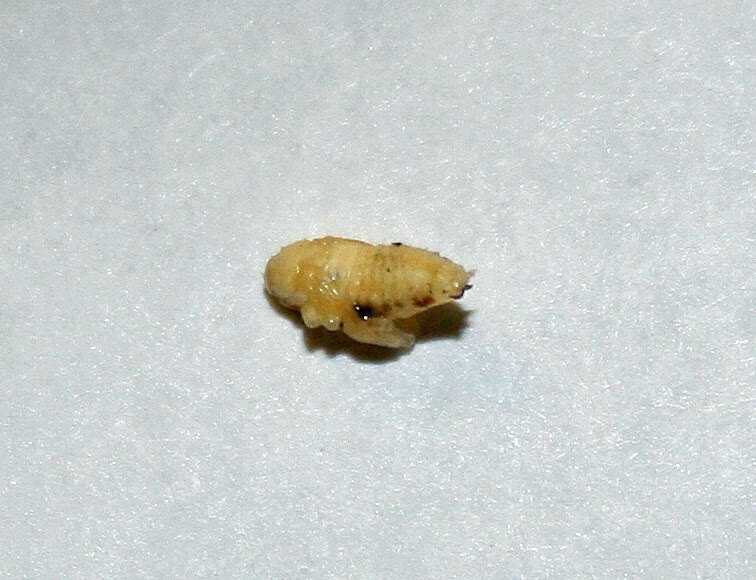 The larval stage is the damaging stage. The larvae chew on stems and crowns of the plant. 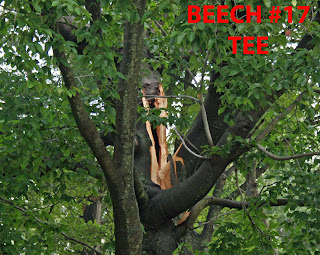 The damage actually looks like wilt during periods of high heat stress. If you don't notice it until then you are too late. The damage has been done. A key component to the program is early season timing. If we can reduce early populations, subsequent populations will be reduced. The pest control theory is to continually reduce the populations throughout the season. By the time we hit the third generation we hope the population is so small that control is not necessary or at least "spot treating" will suffice. The difficulty with control is that life cycle timing of ABW's varies from year to year and generations will commonly overlap. We use indicator plants and regimented scouting to determine insecticide application timing. It doesn't hurt that we've been doing this for many years. 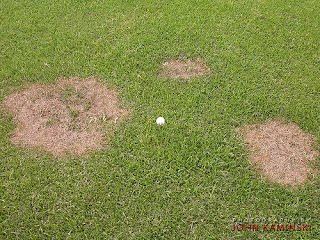 We are well aware of where our "hot spots" are and scouting is done more frequently in these areas. 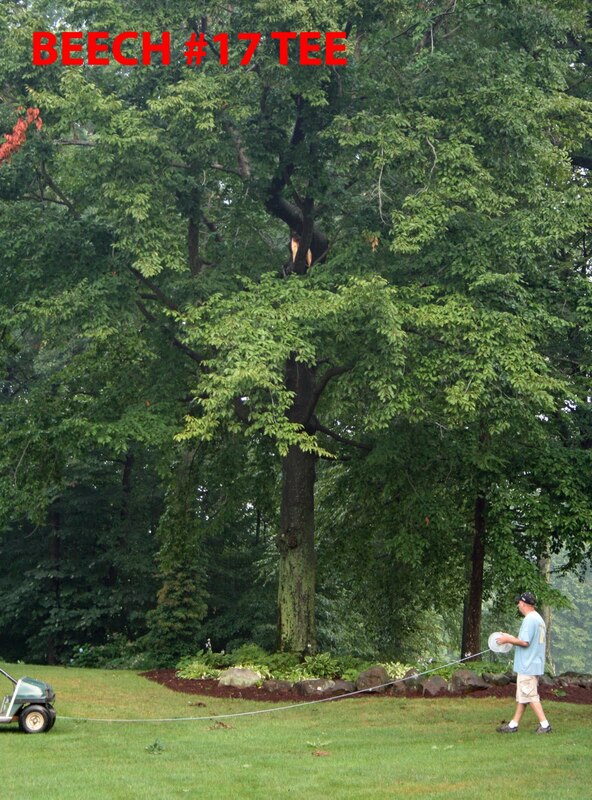 One last issue with control of ABW's is that many courses, especially in Connecticut, are finding that the insects are becoming resistant to certain pesticides. This reduces the ability to attack the pest at different stages in their life cycle. Luckily, we have not seen this problem yet. We are doing just fine this season! Check Out This Website Dedicated To The World Of Golf Course Architecture! In my limited time to surf the web I came across this website... "Golf Club Atlas"
Golf Club Atlas is a commercial free site which delves deeply into the world of golf course architecture. Within this site you will find an incredible amount of information including course profiles, feature interviews, discussion groups and basically everything you ever wanted to know about golf course architecture both old and new. The course reviews are particularly outstanding in providing excellent architectural commentary in harmony with spectacular photography. I have thoroughly enjoyed reading a few of the reviews of courses I have either played or had the pleasure of at least walking. Hottest June on Record! No Let Up In July! We are on pace to have one of the hottest summers on record. Throw in the consistently excessive humidity and you have a recipe for intense turf stress. This coupled with a predominately Poa Annua golf course can make for a difficult growing season. We have been doing great so far considering the circumstances. 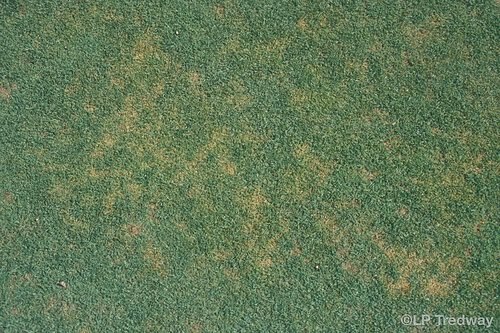 Our tees and greens have been outstanding but we are seeing the poa on our fairways exhibit normal mid-summer stress symptoms. I'll take the normal stress symptoms in this type of weather. Regardless of our execution of proper fertilizer and pesticide applications, Poa Annua just isn't built to withstand long periods of heat and humidity. While we have nothing to be alarmed about, I want our members to be aware that those small areas of discoloration are normal for the fairways even in a less stressful summer. Our goal is to continue to baby the turf through the rest of the season. The "Superintendents' Countdown to Labor Day" has begun. Only 48 days left until we turn the corner towards better weather. Both the turf and its caretakers will be able to expel a sigh of relief and enter the road to recovery. 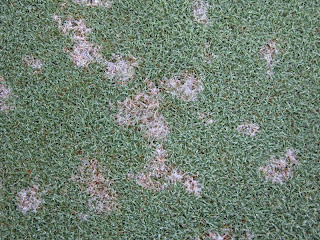 Disease pressure has been intense in all areas but we have been on top of its control thus far. We have had to shorten intervals between pesticide applications to adjust to the unusual weather pattern. Not unexpected. Diseases like Pythium Blight, Brown Patch, Dollar Spot, Anthracnose and Summer Patch are all of concern to turf managers in mid summer. To the chagrin of all superintendents, this season is shaping up to be a banner year for university turf pathologists and pesticide salesmen (industry humor). I will continue to keep everyone apprised of our status as the season progresses. Farms CC celebrates 50 years! I found this article published on the New Haven Register's web site regarding The Farms CC's fiftieth anniversary. It also includes a very nice instructional video featuring Head Golf Professional Jim Hanlon. A major topic of conversation for golf course superintendents the last two years has been how the economy is effecting maintenance budgets. Superintendents and allied associations have been working hard to come up with answers to the question of how to maintain premium playing conditions while reducing expenses. 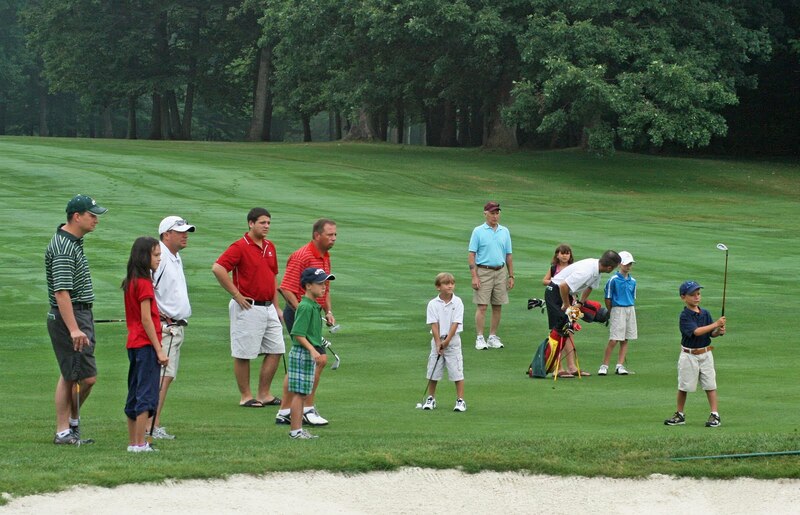 The USGA published a poll which shows where its participants are focusing these budget cuts. Survey results are very similar to my instituted plan at The Farms Country Club. The key to a successful plan is to focus cuts in areas that least effect the member experience. 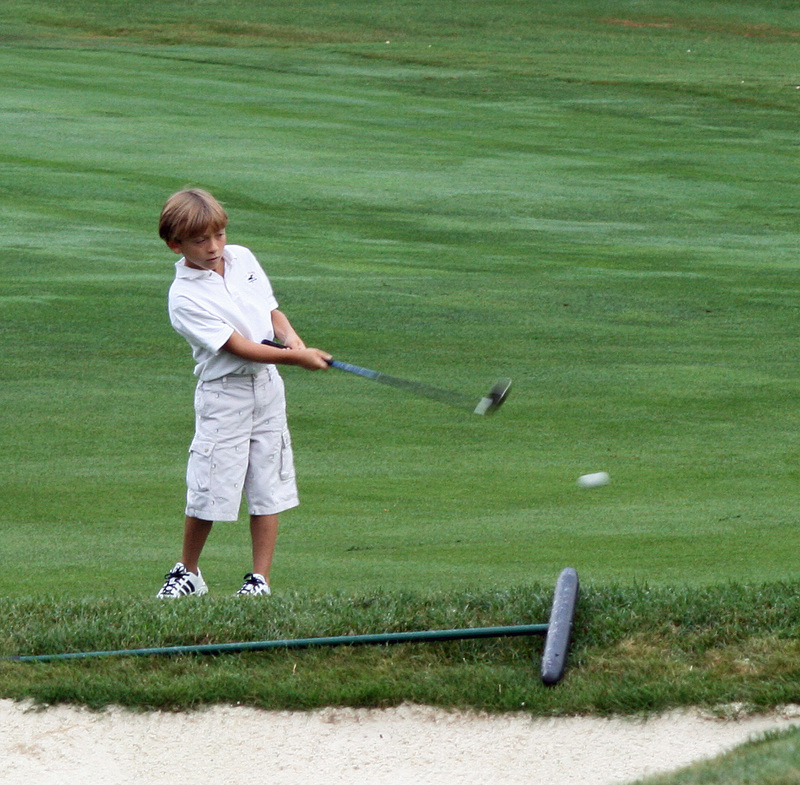 Primary play areas like greens, tees and fairways, continue to be maintained at a very high level. Areas that are less frequented by players like bunkers, rough, etc., receive reduced maintenance. The introduction of more naturalized areas, beautification focusing on more sustainable plant materials, reduced bunker maintenance at off peak times, reduced pesticide applications to "non-prime" areas and other cost reducing programs have made a difference in keeping member satisfaction high while keeping expenses on target with our reduced 2010 budget. I have added a new Blog counter from "Clustrmaps" that shows where all the hits are coming from around the world. The counter updates every 24 hours. You can find the new counter on the top right side of the blog just above the polls. I'm not going to write. I'm going to "cut & paste"! The extreme weather is impacting golf courses around the region with conditions not seen since 1988. Some parts of the region have the added challenge of drought conditions that are straining water supplies and raising concerns over water use restrictions. With soil temperatures consistently in the 85-88 degree range, significant stress on root systems abounds. 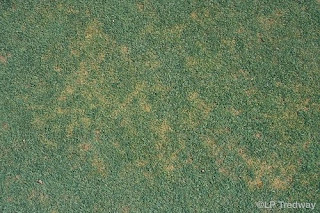 The higher-than-normal stress has ramped up disease pressure, especially dollar spot, brown patch and summer patch activity. 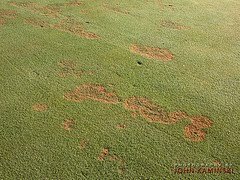 Parasitic nematode populations also are impacting a number of golf courses. There is a potential new bacterial threat to creeping and velvet bentgrass reported by Dr. Mitkowski at the University of Rhode Island. 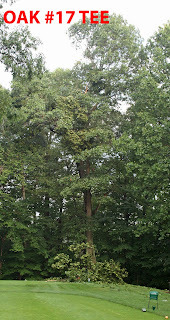 The bacteria, Acidovorax avenae, is active during hot weather causing plants to bleach out (etiolate) and wilt. 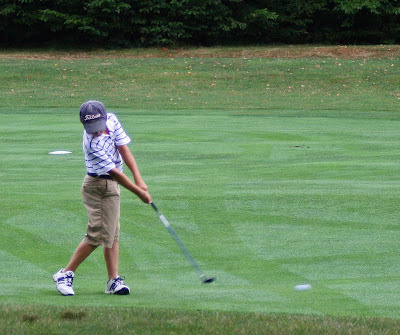 The bacteria has been isolated from infected plants collected from several New England golf courses. Be conservative - this is not the time to experiment with new products or tank mixes. Spoon-feed with light rates of a balanced soluble fertilizer. Go with the basics that have a proven track record. Avoid applying DMI chemistries in the heat. Annual bluegrass is susceptible especially triticonazole and metaconazole so rotate to other fungicide classes until the heat breaks. Be careful using growth regulators on stressed annual bluegrass. Trimmit and Cutless are excellent products with bentgrass greens, but should not be in the mix on Poa annua surfaces in high heat conditions. Stick with Primo for Poa annua greens and keep the rates sensible. Avoid combining Primo, Cutless or Trimmit with any DMI fungicide. The combination can result in over-regulation of heat-stressed annual bluegrass. With the increased disease pressures, shorten up intervals between fungicide applications. Check sprayer calibration and nozzles, and apply at water volumes to reach your target. Follow your gut. If your intuition says don’t do it …don’t. Self-inflicted damage is the hardest to accept. 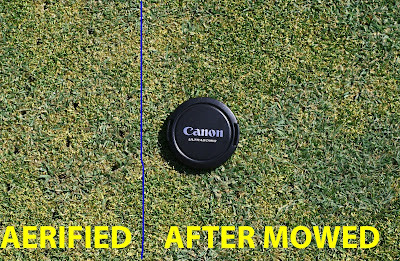 Yes, we need to mow, roll, topdress, and vent greens during some difficult weather, but skipping a mowing or a rolling when the surfaces are saturated can make the difference between success and failure. 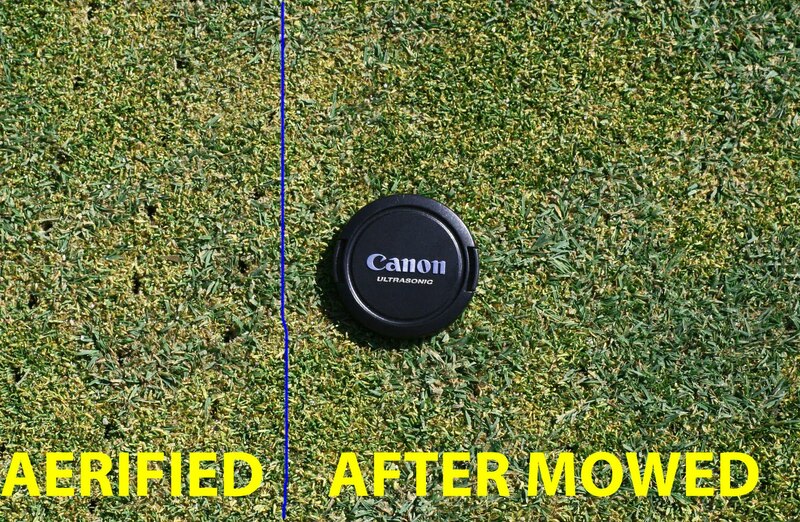 Re-emphasize the importance of equipment operation on and around greens. Make sure mower baskets are emptied frequently. Save the venting and topdressing practices for days when the weather breaks. Monitor soil moisture closely to program irrigation and direct hand-watering and syringing practices. This is not the time to saturate the root zone. Train competent staff about the difference between hand watering and syringing, and be sure they realize the importance of the task. Stay focused and remain flexible to survive the difficult weather period. It’s the first time in a few years we have experienced an extended heat wave, and fortunately they are fairly rare in this region. Hopefully, the weather pattern breaks and brings with it the more seasonal conditions rather than one that will be long remembered. We Are A Step Ahead!!! Ok... You don't know what some of this means... Ask me! 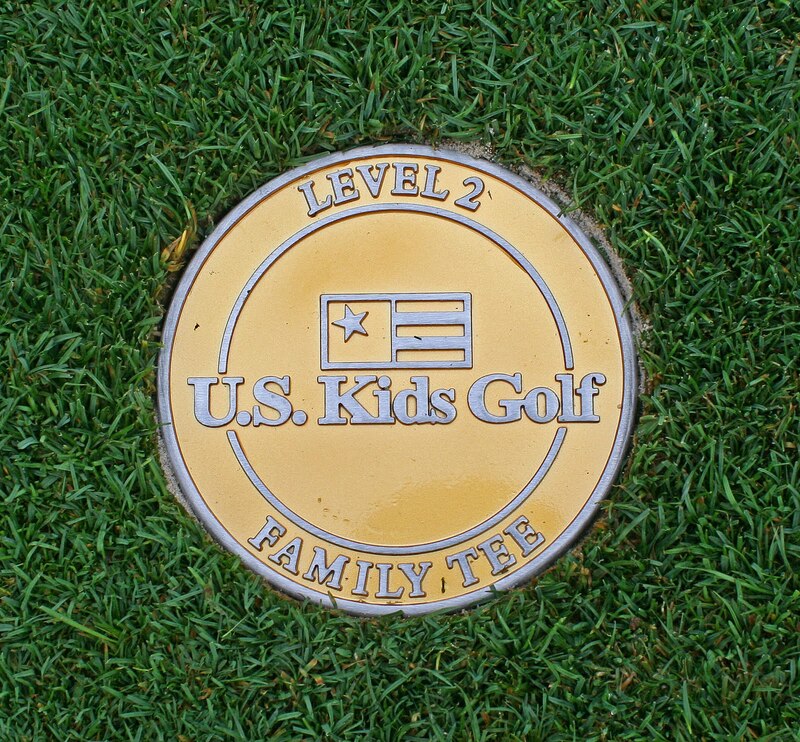 First Assistant Golf Professional and Director of Junior Golf, Dave Burstein, has enhanced the experience for our junior golfers by adding permanent tee markers on the back nine fairways. 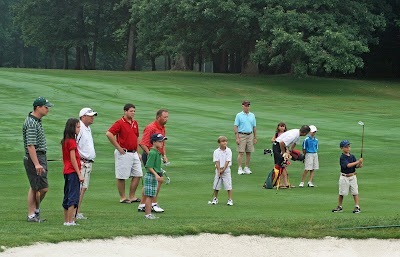 Golf Course Industry SUPER BLOG OF THE MONTH!!! I'm proud to say my blog has been named "SUPER BLOG OF THE MONTH" by Golf Course Industry magazine / website! 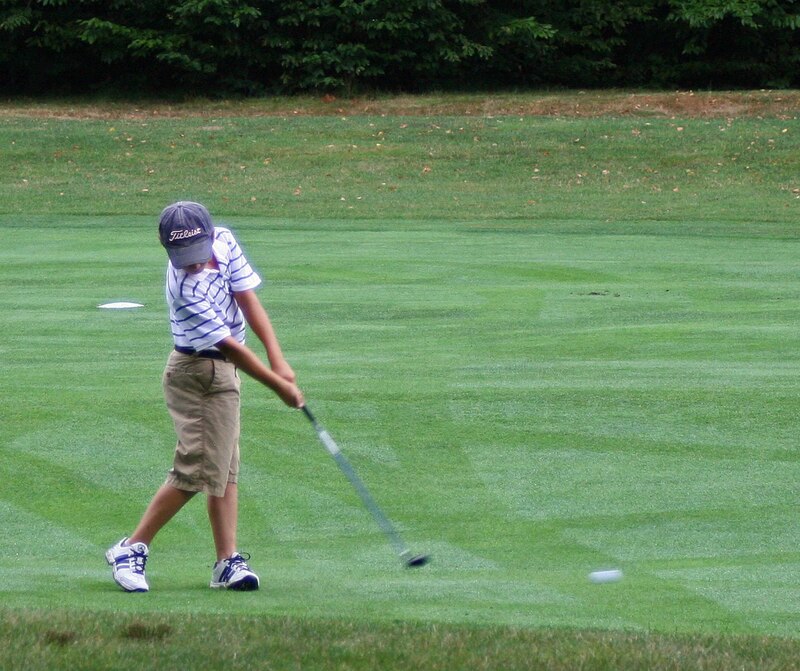 Not long ago, our old friend Paul Sabino of the Farms Country Club in Wallingford, Conn., contacted us and said, "Hey, I have a blog!" Does he ever. 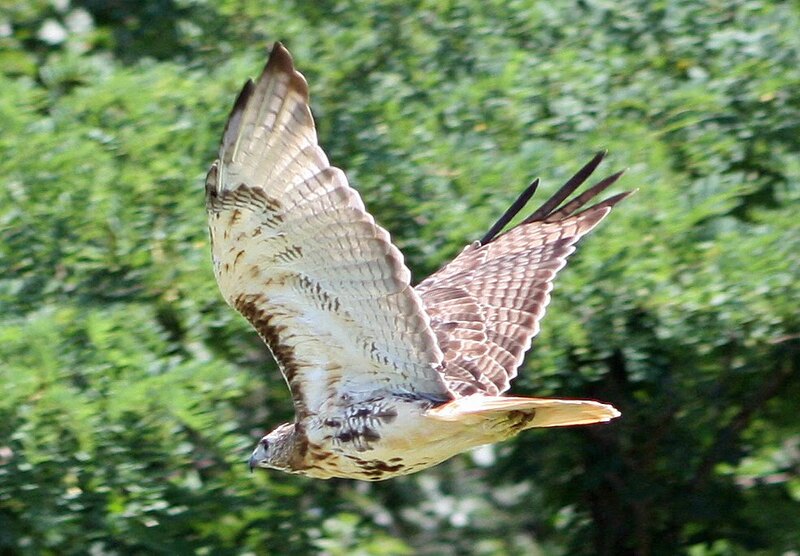 We were particularly impressed with the amazing wildlife photography and the way he emphasizes golfer-friendly programs like his annual "Divot Day" where members pitch in to clean up the course. Paul...you asked for it and you got it! You are GCI's Blog of the Month. 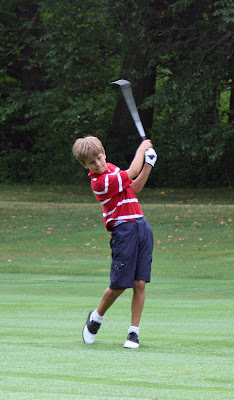 Par 3 Tournament Always Fun! What's Wrong With The Practice Green? 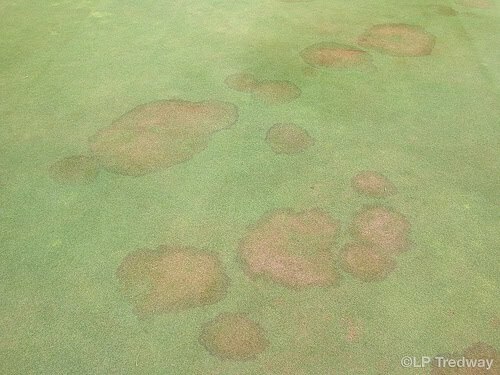 The turf on the practice green is having difficulty adjusting to its new environment, especially with the record heat and humidity. The Poa Annua, Annual Bluegrass, has been growing in an almost completely shaded environment for many years. This creates a problem because it is not genetically suited for the full, all day sun it now receives. Our goal right now is to save as much turf as possible and continually overseed with the desired bentgrass. We are raising the height of cut and will be employing several cultural practices like water injection aerification, needle tine aerification along with added fertilizer and fungicide applications. What does this mean for our members? 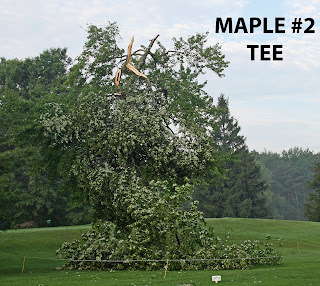 Unfortunately, playing conditions will suffer. It will not putt like the rest of our greens for quite a while. It is imperative that we take this approach now to limit more damage and replace the senescing Poa with the more desired Creeping Bentgrass. What Happens When It's 100 Degrees? We water everything we can over and over and over! There are several things we do to help the turfgrass survive the intense stress. Mostly, light frequent watering helps get the turf through the hottest time of the day. We constantly scout for isolated dry spots by using soil probes. The soil probe takes a small diameter core from an area and the trained staff diagnoses the amount of water needed for the application. Using too much water can be just as bad as not enough. Night watering mostly provides moisture to the soil profile. Daytime watering is used to cool the turf down and remedy the isolated dry spots. 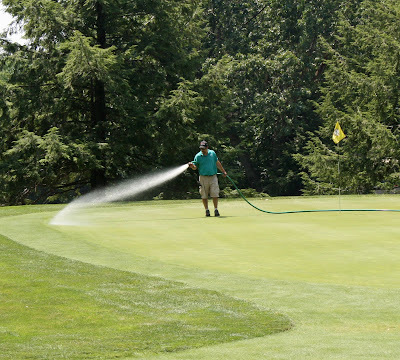 Hand watering with hoses is the most efficient and beneficial way to combat heat stress. The water goes exactly where we want it. When temperatures reach the extreme, like today, we may have as many as seven people working on irrigation. Today there are two men on patrol. They scout the course and direct four men with hoses. The seventh man is driving a 160 gallon water tank and takes care of the landscape plantings. In addition to the labor force, we use several different wetting agents to help get the water into the soil. 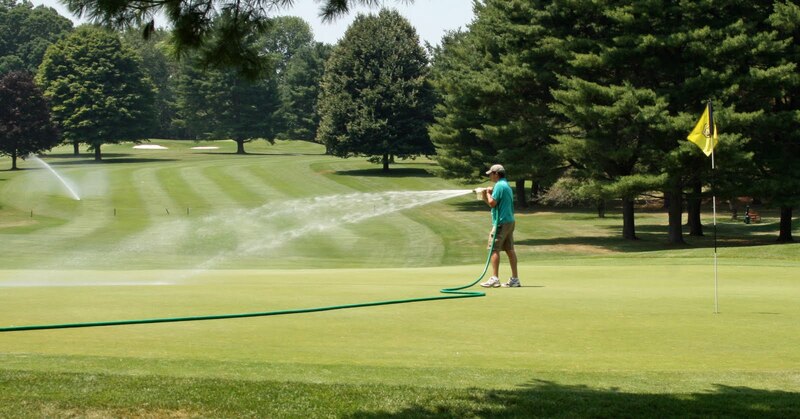 Wetting agents are applied several different ways. Direct injection into the irrigation system, pellets used inside proportioners on the one inch hoses and/or spray applications. In essence, wetting agents break the surface tension and allow the water to penetrate. They make water "wetter".